August. About fifteen years ago. Bungalows plunged into the pine forest of the Tuscan coast. Marghe, my cousin, and me. We sleep in two beds, surrounded by our summer treasures: Mickey Mouse comics, rackets and sun lotion. Next to us Claudia – still a puppy – lost in her dream world of cotton candy. 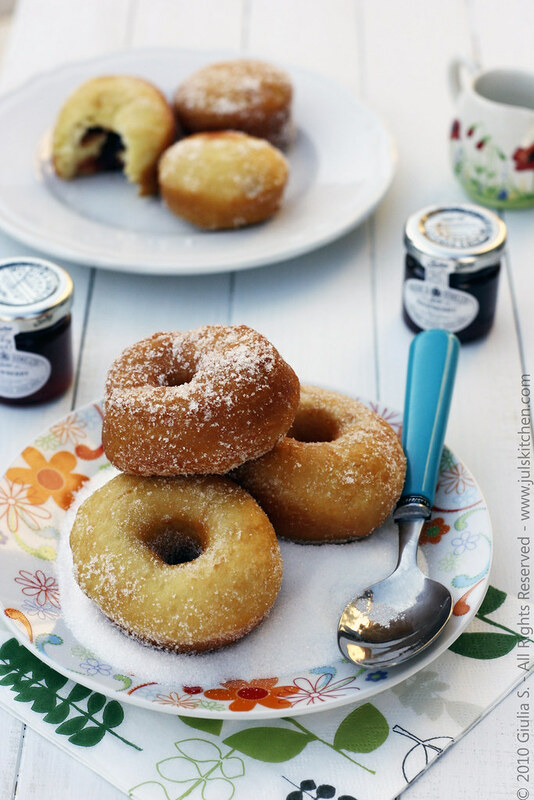 In the kitchen, mom and aunt already chitchatting, but we do ignore them, let’s sleep as long as possible, until he arrives with his old fashioned bicycle and the basket full of good things, he is the doughnuts man. He comes ringing the bell on the bike and singing his rhythmic recall between streets and sandy paths: doughnuts, krapfen, bomboloniii! 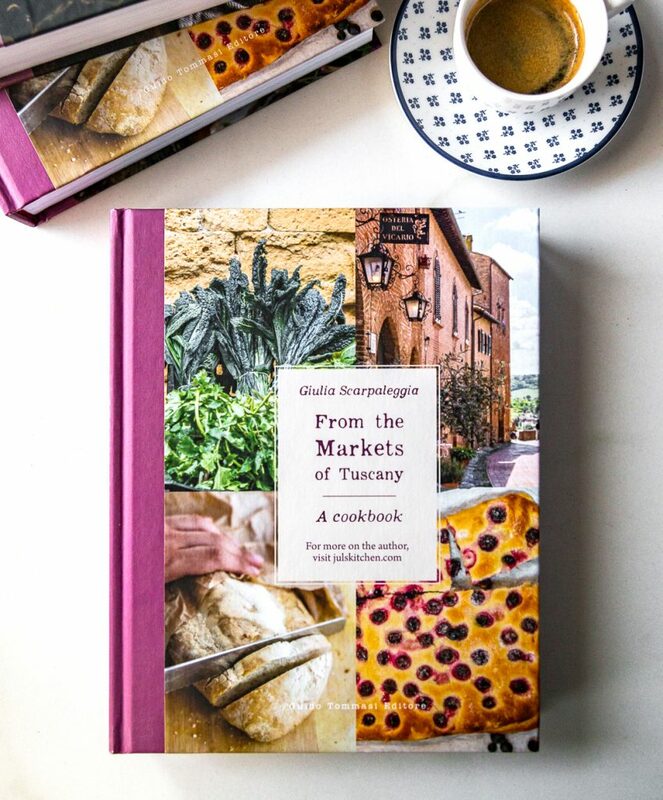 Almost every day our parents go to buy some breakfast, and return with a bag of white paper with everything a fifteen year old girl – still far away from any silly idea of diet – may want on awaking. Doughnuts and krapfen still warm, sugar-coated and ready to be eaten with a fruit juice and sleepy eyes. This summer, in one of the hottest afternoons of August, I decided to try to make them after so many years, and by chance that very day Marghe came to visit us. It has been a dive into childhood! It has been easy to go back to that summer of fifteen years ago… Just close your eyes, bite your krapfen and then lick your fingers sticky with sugar. For the recipe I was inspired by Donna Hay Modern Classics Volume 2. Place the yeast and lukewarm milk in a bowl. Add melted butter, sifted flours, eggs and sugar to the yeast mixture and mix with a butter knife until a sticky dough forms. Bring the dough together by kneading on a lightly floured surface: knead until it becomes smooth and elastic, velvety and no longer sticky. Place the dough in an oiled bowl, cover with a tea-towel and set aside in a warm place for about 1 hour or until doubled in size. When doubled, knead the dough on a lightly floured surface for five minutes and roll out the dough until 1cm thick. Wanna make krapfen? Cut 8cm rounds from the dough with a cutter. Wanna make doughnuts? Cut a hole in the middle of the rounds with a smaller cookie cutter. 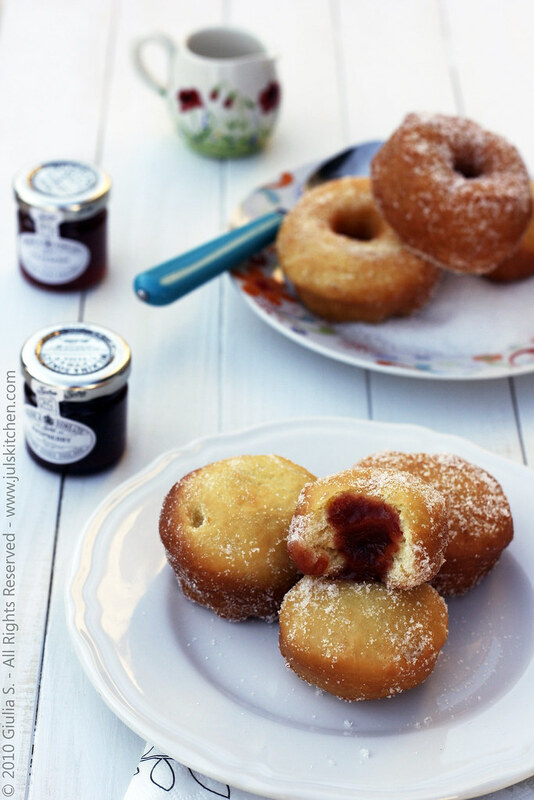 Place krapfen & doughnuts on a tray lined with non-stick baking paper, cover with a tea-towel and set aside in a warm place for 30 minutes or until risen. Heat the oil in a saucepan (I used a wok) on medium - low heat. Test the oil temperature with a piece of dough: the dough should immediately float to the surface and be surrounded by small bubbles. If it does so, the oil is at the right temperature. Deep fry a few doughnuts & krapfen at a time for about 1 minute per side or until they are golden. Drain on paper towels. 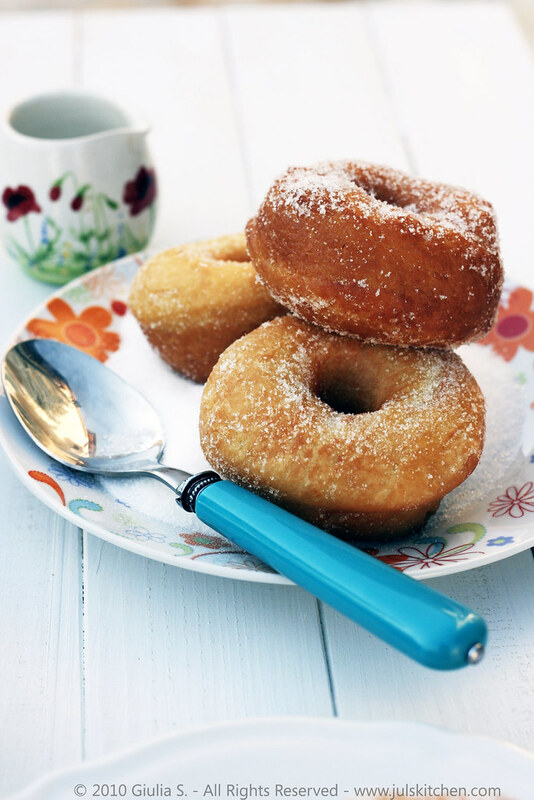 Doughnuts are now ready, just toss them in sugar. Krapfen should instead be filled with a pastry syringe with your favourite jam and then tossed in sugar. Serve warm. Tasting test. I reckon they are not like those we used to eat at the seaside. Perhaps it was due to the lack of the smell of the pines, to the absence of salty air on my skin and sea sounds on the background… but honestly they were not so bad! 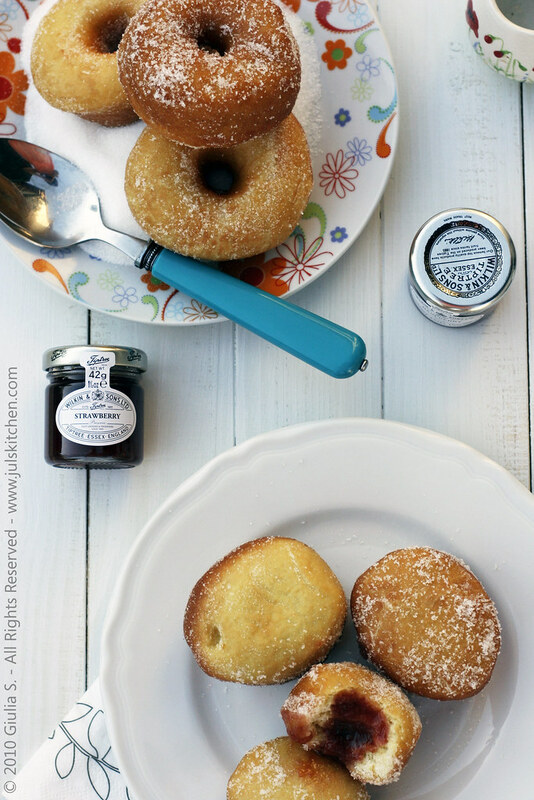 The chosen jam for krapfen was a homemade plum jam, sharp and lively, a perfect contrast with the sweetness of soft fried dough. Breakfast – but why not, even an afternoon break – made with doughnuts & krapfen has a regressive power for me, licking my fingers covered with sugar included! 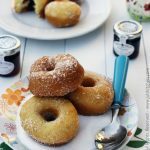 For a complete analysis of the doughnuts world, have a look at Michele and her delicious post on 5am Foodie! You won’t be disappointed! Here in Germany, we have a specialty which is called “Berliner”. A kind of “Krapfen” that is filled which jam or traditional plum jam. Delicious. I was just going to say pretty much the same thing as Andreas said above me. We are spoilt for choice though because there are several interesting fillings for the “Berliner” we get here. love yours! Funny how childhood memories and doughnuts seem to go hand in hand. Maybe it’s because doughnuts are such a treat when you are a child. Your photos are gorgeous (as ever) and I can picture the pine trees, the beach, and your younger self enjoying these on a summer morning. Doughnuts for breakfast!! You temptress you! I’m licking imaginary sugar from my lips just looking at them. @ Andreas: I would love to taste a berliner right now! @ Meeta: you Meeta should tell me a lot about Berliner and fillings and eberything related! @ 5am foodie: waiting for your post! @ Sarah: wiked, I love this word! Hi there… new to your blog, but I am completely blown away. Your photos seriously look like they were ripped right out of a magazine. You have some amazing talent! Both behind the lens and in the kitchen. I can’t wait to read more of your posts. That looks absolutely delicious! great photos! This looks so delicious! Beautiful photography too! You have such a nice site here! I would join you! What a great post, and the pictures are fantastic! These are absolutely positively gorgeous!! Wish I could bite into them now. Those look great! Excellent photos! What is manituba flour? Lovely post! Could almost smell the salty ocean breeze! PS: My hubby would go gaga over these doughnuts. hey there and thank you for your information – I’ve definitely picked up anything new from right here. I did however expertise some technical issues using this web site, since I experienced to reload the web site many times previous to I could get it to load properly. I had been wondering if your hosting is OK? Not that I am complaining, but sluggish loading instances times will very frequently affect your placement in google and could damage your high-quality score if ads and marketing with Adwords. Well I’m adding this RSS to my email and can look out for a lot more of your respective interesting content. Ensure that you update this again soon..